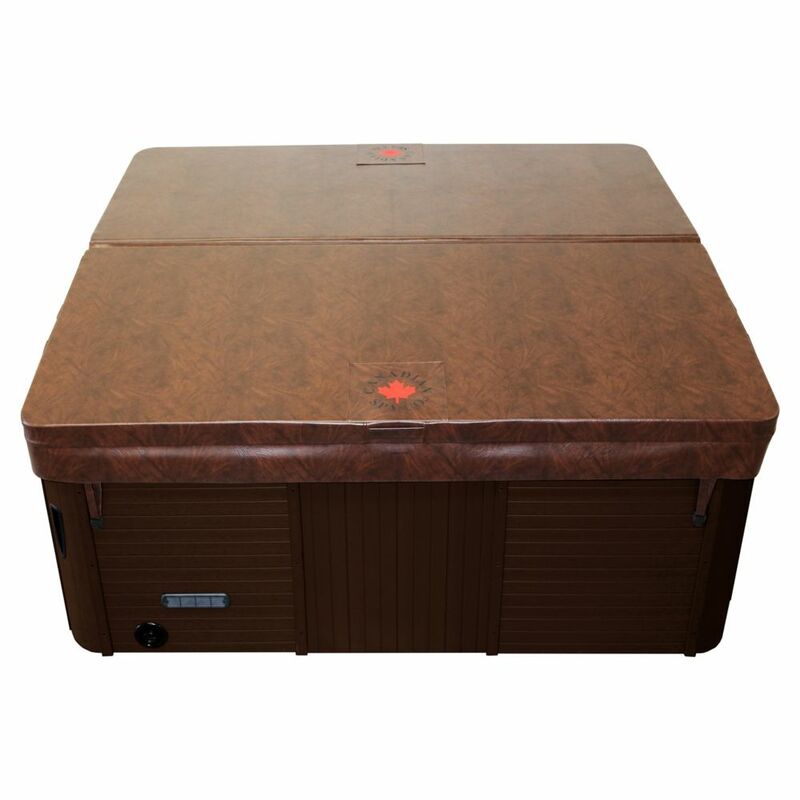 88-inch x 80-inch Rectangular Hot Tub Cover with 5-inch/3-inch Taper in Chestnut Canadian Spa Company hot tub and spa covers provide unbeatable quality at an affordable price. Our covers are made from the strongest marine grade vinyl in the industry to withstand the harsh winter months and are both UV and mildew resistant. 6 re-enforced handles are built in at convenient points for carrying your spa cover and for simple cover removal. Adding to this support are 8 locking straps which fasten to the corners of the tub which are ideal for locations with lots of wind. The extra-thick 5 in/3 in insulating foam inside the cover is vacuum sealed with a 6 mil double coated polyethylene vapour barrier to increase the longevity of the cover and retain water temperature within the spa. For additional support, a metal C channel is added at the centre of each foam insert. Our cover includes an extra thick full-length steam seal inside the fold to trap any excess heat that would escape through the side of the cover and minimize heat loss. 88-inch x 80-inch Rectangular Hot Tub Cover with 5-inch/3-inch Taper in Chestnut is rated 4.8 out of 5 by 4. Rated 4 out of 5 by Leena from Great cover Replacement for a water-logged 8 yr old cover for a Beachcomber tub. Best price by far, and no charge for shipping to our remote location was a big bonus. Nice and light and thick, taper from middle great at dispersing rain. Only complaint is the clips are too tight so difficult to clip; old bottom clips fit the new tops much better so wonder if wrong parts? Hence 4 out of 5. Rated 5 out of 5 by Mick from Love it out of the box. Lightweight, fits well, will have to see how it holds up over time. Love it out of the box. Lightweight, fits well, will have to see how it holds up over time. Will this cover fit a Beachcomber model 160? The manufacturer does not know the answer. My measurement of the tub itself is 88 x 80 so I would assume this cover is too tight. 2 questions. How do i make sure the fold is 88&quot; long? what is the corner radius of this product? Thank you for your inquiry. Our covers fold on it's longer side, in this case it folds on the 88&quot; side and it has a 6&quot; corner radius. If you need further information, do not hesitate to contact us. Where does the cover fold, on the shortest or longest side,do we have the option to choose? Thank you.